Naomi had left Israel with her family during a famine to live in the neighboring country of Moab. While there, her sons married women of Moab. Naomi's husband died...then her sons died. She was left alone with no family other than her daughters-in-law. In her despair, Naomi decided to move back to her home in Bethlehem. When she went to leave, the wives of her sons sought to join her. She encouraged them to turn back to their own families. One did. But one would not. 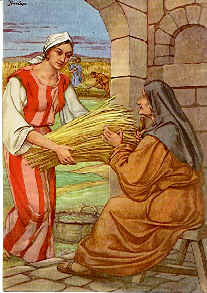 Ruth begged Naomi to let her return with her. The Bible shows us that somewhere along the line, Ruth had become a believer in the God of Israel. Ruth 1:16-17 states: But Ruth replied, "Don't urge me to leave you or to turn back from you. Where you go I will go, and where you stay I will stay. Your people will be my people and your God my God. Where you die I will die, and there I will be buried. May the LORD deal with me, be it ever so severely, if anything but death separates you and me." supply for their needs. Everyone in Bethlehem saw Ruth's hard work and concern for her mother-in-law (Ruth 2:11). Despite her ungodly heritage, Ruth became known as a virtuous woman. Just as Ruth was concerned for Naomi, Naomi was just as concerned about Ruth. She wanted the best for her. When she noticed a budding respect between Ruth and Boaz, a long-lost relative that had shown kindness to Ruth by letting her glean in his fields, Naomi encouraged the match. (Note, part of the Hebrew law provided the landowners not harvest all their fields, but leave some grain for the poor and the foreigner to glean from so they could provided for themselves). Ruth, knowing that Boaz could provide for the aged Naomi, followed Naomi's instructions to propose marriage to Boaz. Both ladies offer a beautiful portrait of selflessness. Each clearly wanted what was best for the other. Now, don't feel sorry for Boaz. He loved Ruth and jumped at the chance to marry her. And it appears from the Bible account that Ruth loved him too. They were married and had a baby, which was named Obed. Naomi was blessed by this child, having the opportunity to participate in his rearing. What a perfect end to the story! But the story doesn't really end here. Ruth was a woman of virtuous character. She married a man of virtuous character. The union of this noble couple continued the line of descendants who also loved God, leading up to the birth of the Christ Child on that first Christmas day.